We really enjoyed our trip to the lake. Matt and I drove in to Roanoke on Saturday for my birthday. We went out to eat and to a movie. I had fun, but I was definitely excited to get back to the house to see Lil Miss. I realized at this moment just how hard it was going to be to go back to work on Tuesday. Here is Madison on her very first boat ride. She's in Makenzie's lifejacket. Madison was a little more fussy at the lake than she is at home. We had a few rough nights...although I don't think anyone believed us after watching her during the day. Our sweet girl spent most of her time napping on her "More Gramma". Seeing her with my Gramma makes me so happy. Gramma and I talked about how it'll just be a matter of time before she's spending the night and Gramma is reading the jokes out of the Reader's Digest to her. I often forget now how tiny Madi still is. She just seems so big to me now...I guess because I'm so proud of how much she's grown. But every time I dress her, I realize that she's still quite the Munchkin. Every time I see that "Newborn" tag, I'm reminded that a lot of babies are never small enough to wear newborn clothing. Most start out in 0-3 months, which is still huge on Madison. And then there are the times when we're out and someone says "Ohhh, there's a brand new baby" or "How old is she? Just a few weeks". Matt and I have seen so many changes in Madison over the last 7 weeks. She's starting to sleep at night and only kind of nap during the day....instead of sleeping during the day too. I love just watching her sleep, but I also love her awake time. I love the faces she makes and watching her eyes take in the world. I'm constantly bragging about how lucky Matt and I are. We really do have such an "easy" baby. Madison really just doesn't cry much. And we never have to guess what it is that she wants/needs. 98% of the time if Madison is crying, she's hungry. And when she's hungry, she wants the bottle "NOW". I'm serious, the girl already loves to eat. 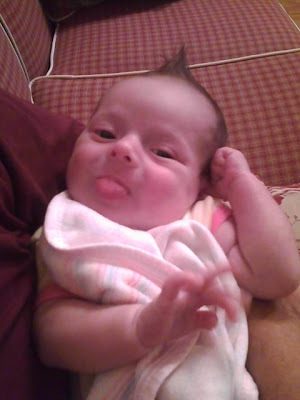 Hmmm, pretty sure she gets that from me. I get a little (okay, a lot) cranky when I'm hungry too. She sleeps in the most funny positions! Here she is all cuddled up with Nana. Our little lady is so entertaining. She already seems to be developing her own little personality. Aimee and I talked some this week about her moving away. It's not something I'm ready to deal with yet...so that's all I'm going to say about it for now. Madison is 6 weeks old today. 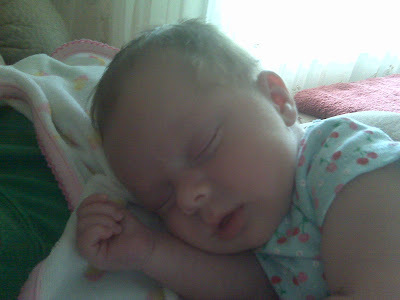 It's so hard to believe that this past Saturday was her due date. She saw the pediatrician again yesterday. She now weighs 7 pounds, 10.75 ounces and is 21 inches long. Her next visit is in 4 weeks, and she'll have to have shots. Yikes! Matt and I are both doing really well on the diet. We designated Mondays as our weigh in day, which means that our first week only consisted of 6 days. Matt lost 5.5 pounds and so did I! I was so proud of both of us! Tomorrow I see my doctor for my 6 week postpartum checkup and then we're leaving for the lake. It'll be her first trip of many to Smith Mountain Lake! I just hope she loves it as much as we do! I need to post pictures soon! I started Weight Watchers today. I told myself I would start last week, but I failed miserably. And then I told myself I would start yesterday, and I failed miserably again. And then last night, I told myself that I know I do not want to stay at the weight I am at now. So today, I successfully started. I am a HORRIBLE dieter...which is why I love Weight Watchers. And I probably don't work the program as well as I should, but it allows me to diet in the only way that I can...with flexibility. And I'm sure there are days that I will eat either pickles or green beans for dinner because I have already eaten all my points for the day...but hey, it works! Speaking of Matt, we found out yesterday that he was accepted into the LPN Program. I cannot begin to express how proud I am! We went out to eat to celebrate (which is why I need to be on a diet in the first place! haha). His first day of class will be July 20th. I am going to call Madison's daycare to see if they will hold her spot until then. I am thrilled that he will be able to keep her until then. It makes the whole going back to work transition a lot easier for me. Sunday was my first Mother's Day! Matt and Madison got me a pink zebra print Dooney. I love it! Last night, I made Matt get on the scale without Madi and then with her to get an estimate of how much she weighs now. According to our scale, she weighs 7 pounds 8 ounces...nearly 2 pounds more than her birth weight. She amazes me! You are one month old today. I cannot believe how quickly the time has passed. It still feels as if we just came home from the hospital. I also cannot believe that your actual due date is still one week away. Months before you arrived, Daddy starting turning on the lamp in your room every evening. I'm still not really sure why he did it, but I think it was that he was just that excited for your arrival. And even before you were here, I spent a lot of time rocking in the glider in your room. Being in your room gave me so much peace...just as you do for me now. Every day it seems like you're doing something new. You are already so cute and funny! Just this week, you've started swallowing when you're hungry before you have a bottle in your mouth. It's hilarious! We've also started talking in this really "excited" voice when we're about to give you a bottle. You get so excited! It's cute! This past week, I read to you for the first time. I read Green Eggs and Ham. You just listened to me read the whole book, all bright-eyed and calm. You absolutely love being held and being talked to. And I have to admit, we love showering you with attention. You have already brought us so much joy, and every day with you is such an adventure...a true blessing. Happy One Month Birthday to you, sweet girl! Why am I awake at 6 am, you ask? Because Madison isn't sleeping...well at least she wasn't until I decided to just throw in the towel and come downstairs with her. Madi slept really well from midnight to 3:30. And she's been up until just a few minutes ago. We've gone through 4 different sleepers. Oh, and we had to take the changing pad cover off because someone peed all over it...AGAIN! haha. I've been up for almost 3 hours now and I didn't go to bed until 1. I don't think I've slept this little since college. Why was it so much easier then? I guess I could be sleeping right now, but it seems kind of pointless. I'm sure she'll be up again in just a few hours...and I don't really feel like I can go back to sleep anyway. I keep thinking more and more about having to go back to work. I never dreamed it would be something I'd struggle with so much. I thoroughly enjoy every second with Madison....even when she won't go back to sleep, even when she throws up ALL OVER me, even when it takes me an hour to get her to eat 2 ounces. I just think it's going to seem so strange not spending the day with her. How am I going to be able to focus on work? I was talking with my momma about all of this and about how it's not so much that I think I'll worry about her all day. It's mainly just that I think I'll constantly wonder what she's doing. However, I do wonder if she's ready. She truly is eating so much better...but, even now, I'm not sure that she eats as well as a term baby. I just don't know that they can take the time with her that she requires. We still have a little more time though, so maybe she'll be eating even better when it's time to go to daycare. One more thing...Madison has now outgrown almost all of her Preemie clothing and is wearing Newborn. Yay!! !